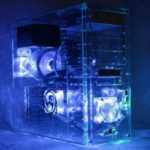 SkycoinLab has lots of technical problems – dont invest here! Skycoinlab makes bitcoin mining simple so everyone can benefit from the cloud mining . Their goal is to bring the excitement of earning money from bitcoin mining to their clients without the stress that can go along with the maintenance. Skycoinlab want to build the future of cryptocurrency mining together with their highly valued customers. The Canadian cloud mining company has been on the market since 2014 – at least the website has been running ever since then. The About section on the webpage does not disclose any relevant information on the company background. No information is available on the owners or founders, neither on the company structure. They provide the company goals and missions on only a very high level. The Skycoinlab.com domain has been paid for 3 years back in 2014, that will be expire in 2017. From searching on the internet, it turns out that the owner of Skycoinlab is Mr Michel Lavoie who is based in Sudbury. 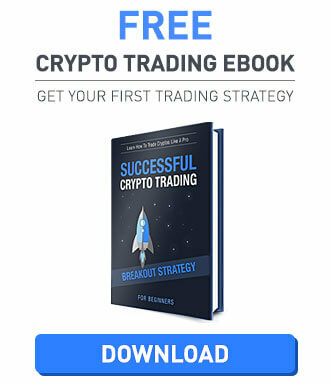 The only real article talking about him is listing his scam activities prior to Skycoinlab. There are no Linkedin profile or any other posts to prove this information is not true which is a big red flag. 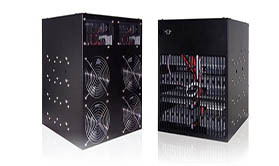 Skycoinlab uses 28nm ASIC technology for cloud mining bitcoins that is providing 2000 GH/s hashpower to the network. The data center is powered with solar panels to save electricity costs. They guarantee 99.9% uptime and making their best to provide continuous mining experience to their customers. However there is no information on the location of the mining farm. Also the pictures used on their website about the equipment turns out that these are existed well before the website launch. Skycoinlab offers cloud mining solutions for bitcoin, litecoin, dogecoin and darkcoin. SHA256 algorithm is supported therefore only, no further altcoins are available. At Skycoinlab, users can purchases unlimited number of contracts. Each contract has an expiration date that is specified at registration, contracts are usually signed up for a one year period. After expiration, client may opt to renew the contracts, but it is not mandatory to do so. After signing up for a contract, users may choose to upgrade to bigger plans, but not able to downgrade. Once upgraded, the more hashpower will come into effect immediately on the client’s account. The miners at Skycoinlab are mining for the GHash mining pool, one of the biggest bitcoin mining pools on the market. 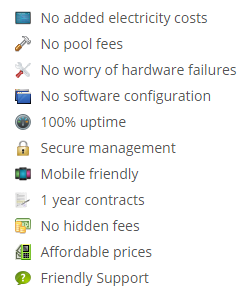 Users however are not able to choose a different pool to mine in. The payouts are received daily on the accounts. There is a reinvestment option at Skycoinlab, so the pro rata share of profit generated from the cloud mining activity can be chosen to be reinvested automatically by the engine. The percentage can be given by the user in from a range of 0-100%. Skycoinlab does not offer its own bitcoin wallet, so they direct their clients to Coinbase or to Blockchain to use their services. This means that upon registration, users have to provide a bitcoin address where the cloud mining results are paid out to. All of the contracts can be purchased from bitcoins only, no credit cards or wire transfers are allowed. Bitcoin cloud mining contracts starts from 0.99 USD at Skycoinlab. The price of the cloud mining contracts is expressed in hashpowers. The pricing schedule is fairly straightforward, everything is priced the same. There are always two options to choose from for any coins: Cloud Contracts and Sky Contracts, the difference is based on the minimum hashpower that can be purchased. Cloud contracts are the plans with higher fees for lower amount of hashpower purchased. Sky contracts are the plans with lower fees for higher amount of hashpower purchased. Skycoinlab does not charge maintenance fee on cloud mining contracts. The Skycoinlab website has some clues on their cloud mining contracts, but definitely not providing detailed information on the underlying technology or hardware. Their English is sometimes difficult to understand on the site, have duplicated or missing words. The site has a news section where there are referencing articles about bitcoin, blockchain and cloud mining, mostly from Coindesk, but no news are shown about the company. The support team is available 24/7 to answer any queries from customers via the live chat or the hotline, at least this is how they advertise themselves. Because on forums couple of users complain about the inability to reach the operators or anyone from the support team for a longer period of time. The FAQ section on the page is running under the name of Answers button. From the 18 questions, 12 is a direct copy from Coindesk website about the nature of bitcoin. Skycoinlab is a Canadian cloud mining service provider that aims to bring bitcoin mining to everyone. 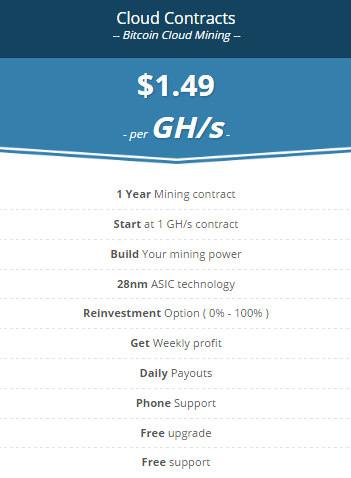 They offer bitcoin, litecoin, dogecoin and darkcoin mining options from 0.99 USD. They charge no maintenance fee or other hidden charges, all fees are included in the price of the Cloud and Sky contracts. Their pricing structure is very transparent, users can calculate right away how much money they wish to invest in cloud mining. However there are several red flags regarding to Skycoinlab activity that should warn potential users before signing up on their website. There is no information about the owners or founders of the company. The payout methods are not specified in detail and no real information is provided about the mining facility that would help prospective users to believe, that Skycoinlab runs cloud mining activity indeed.